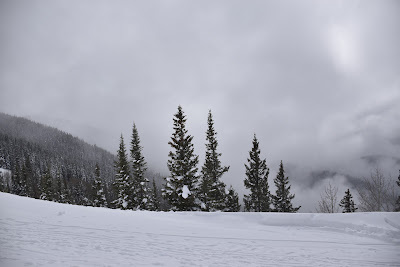 As we return to Texas and spring, I thought what is unique to Texas and vastly different than the Colorado series. I settled on the Texas state flower, bluebonnets. While I was taking pictures of the bluebonnets, I heard the familiar sound of buzzing bees. Using my macro lens, I was able to take very close-up pictures of the bees. With this picture, I did not have the shutter speed at the highest I can set it (1/4000). This is why the wings are blurry. The bees wings were moving so fast that my camera at that shutter speed was not able to capture them in focus. The last pictures I am going to upload are panoramic ones from the tops of mountains and a timelapse of a sunrise that I shot. I really enjoy the panoramic pictures. I like to see how all the individual pictures come together to create a big one. I specifically like this picture because it appears that the mountains go on forever. While the sunset was not as interesting as some of the ones in Texas, these rolling clouds helped to make it interesting. I divided this picture into thirds both from the top to bottom and left to right. Starting from the bottom, it goes snow, the mountain, then the sunset. The snow and sunset are brightly colored then there is the dark but visible mountain. From the left to right, it goes the clouds, sunset, and mountain, then the tree. This is opposite of the top to bottom. From left to right it goes dark, light, dark. As the Colorado snow series is coming to an end, the pictures will soon return back to Texas. There are many flowers on trees and plants and now that summer is approaching, there is actually leaves on trees. I also have been experimenting with long exposure photography. In addition to the plants and trees, there might a picture or two that is a long exposure. 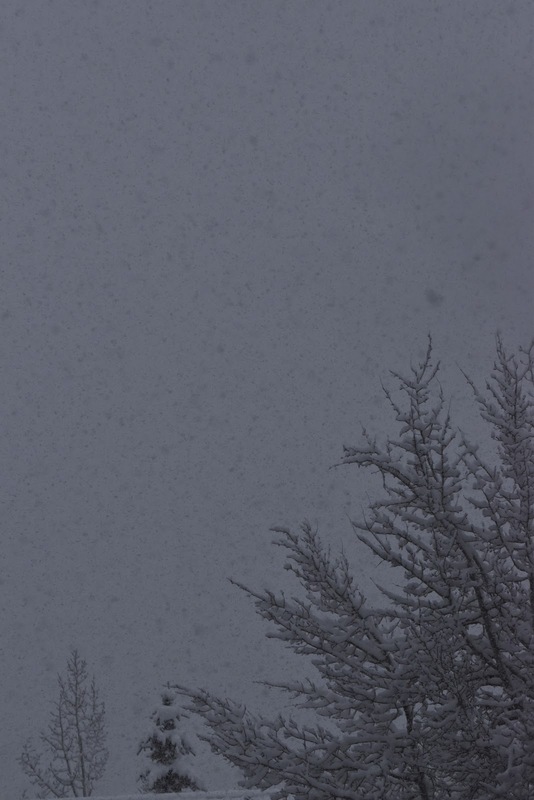 I spent my last day in Colorado outside in the snow then when the sun started to set, I took pictures of it. I wanted to capture the sunset but I also wanted to capture the snow from the mountain. I put the tree into a silhouette but I didn't increase my exposure too much which. If I did, I would have not been able to capture the snow, making it like some of my over sunset pictures. Similar to the last picture the clouds were on my side. They appear to part and open up the view to Aspen Base Village. Looking back at the picture, I am noticing many lines throughout it. There are lines from the gondola, the poles holding up the gondola, and the lines from the streets. I took this picture high above the ski runs and mountain tops. Below me was Aspen Mountain and the race area on the mountain. Looking out and past Aspen Mountain were other mountains I do not know the names of. I was lucky with the clouds for this picture. Clearly, there are many of them in the sky but for this picture, they seemed to part just for me. After the pictures from the top of the mountain, I rode the gondola down. I was able to capture some incredible pictures. Unfortunately, there was water from melted snow on the windows of the gondola. This created some blurry spots, but otherwise, the views were clear. There were also some clouds that blocked me from seeing all the way down to the base but there were a few windows when I was able to see through them. This picture is similar to the last one except I zoomed in for this picture. By the time I took this, snow had already begun to fall. You can actually see the snowflakes in the clouds. I also like how the clouds have different densities on different parts of the picture. In the middle, the clouds are almost solid but in the bottom right, the clouds start to thin out. I captured this picture after the third and final snow storm. I took my camera to the top of the mountain and took pictures. There is this huge drop off that leads to rows and rows of trees. Most days (especially in the summer) you can see forever. But the day I took this picture there were clouds from the earlier snow storm. I have a few more pictures from the same spot after this one but by the end of this week, I believe that these are my last snow pictures. This picture is one of my favorites of the series. It is so simple how the colors are only dark grey, green, white, and black. 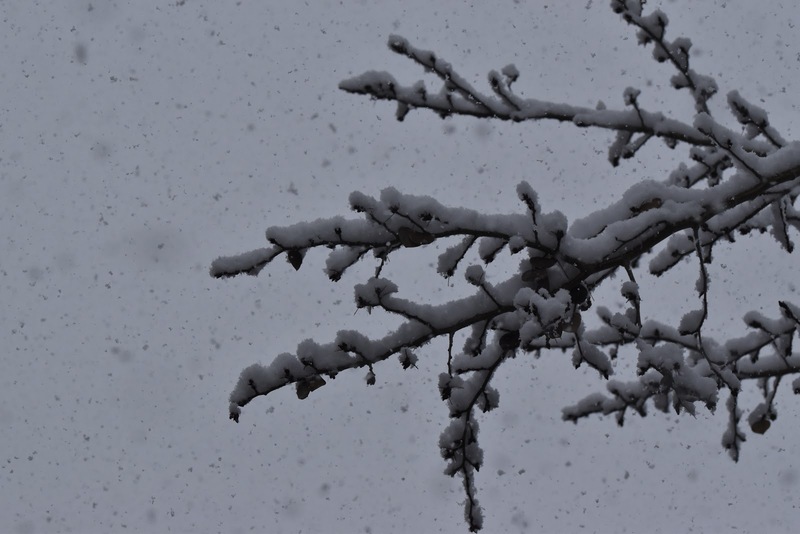 There is snow all over the branches and trees but the only branch is this small one that is in focus. But if you look in the background there are the green trees which you presume is where the branch is coming from. It is very simple, clean, and the colors are very nice. I enjoy this picture because of all the different textures of snow and the tree. There is the softness from the snow. It almost looks like clouds it is so soft. 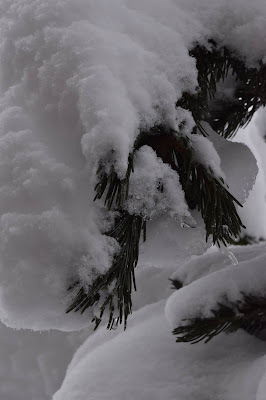 There is also the sharpness from the pine needles whose color helps to balance out the white snow. The heavy snow also accumulated on the walls of buildings. One of those buildings was this uneven brick wall. Only on the bricks that stick out is the snow on. 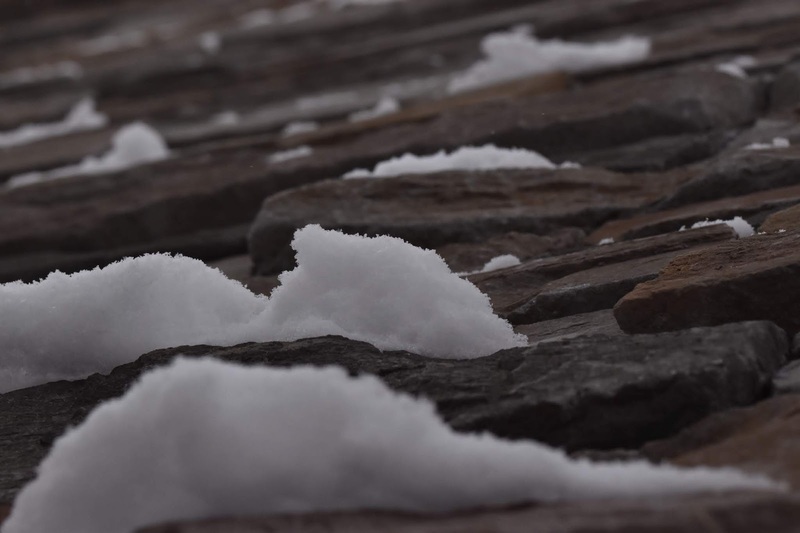 I like this picture for the definition on the snow and brick that is next to it and because of the contrast between the snow and brick. I like how you can see every small detail on the snow. Also, the contrast from the light snow and dark brick are very nice to my eyes. The picture is mostly dark but there small spots with white snow. Most of the times when I was on the mountain, I took about ten pictures in a row with each picture facing a different direction but from the same point. Using Photoshop, I was able to create this image of eight imagines. I wanted to create a panoramic picture. Using the eight images and the crop tool in Photoshop, I was able to make a panoramic picture. While there is not as much definition as the last pictures, I like this one because you can see everything on the ski run. 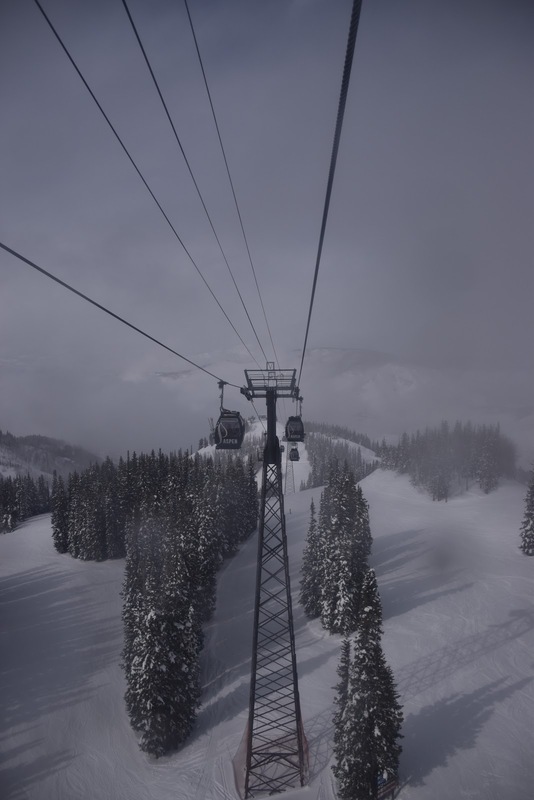 Spring skiing typically brings blue skies, higher temperatures (above freezing), and slushy snow. This spring there were several storms that dropped feet of snow. I enjoy seeing everything covered in white snow but there are some parts that stick out and are not white. All over the picture, you can see brown or green spots, these are trees. They stand out against the white background which makes the mountains look very interesting. The day after the snowstorm was blue skies and white snow. It was some of the best skiing that I have experienced. I took this picture from the middle of a ski run which is why it looks as if this trail could continue all the way to the base of the mountain. I like how there are the skiers in the middle of the run. This makes the snow not seem like 'dead space.' Without the skiers, the entire bottom half of the picture would be white snow, that wouldn't be as interesting. The trees at the base of the skiing mountain where covered in lights. I enjoy them because they stand out against the white snow. I wish the lights covered all of the branches and limbs on the tree, but I can't control that. It would have been very interesting if there were just lights scattered around the picture on the branches. 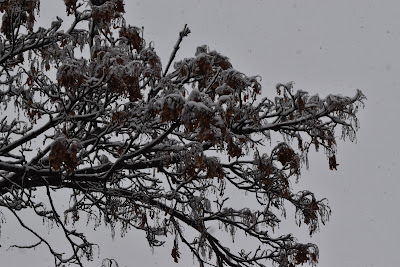 Near the clocktower was this branch with dead leaves covered in snow. 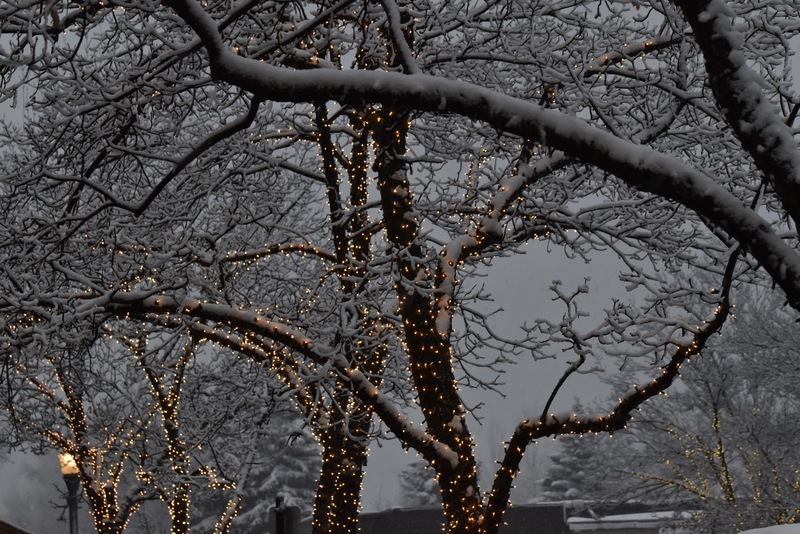 I really like this picture because of the contrast between the white snow, dark-colored branches, and brown leaves. Each object is popping out in front of the grey background which I like. The snow on the branches and leaves adds a nice bright color and softness to the picture. I like this picture because of the contrast between the branches and the icicles/snow. The branches are a dark brown and possibly black color while the snow/ice is a bright white. 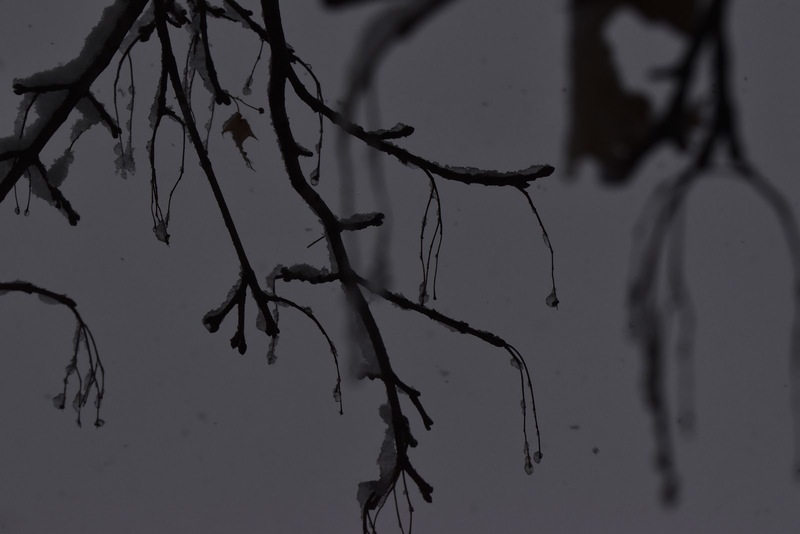 The branches almost look like black icicles. They are small twigs just hanging onto the tree. The branches are collecting snow and ice which is why I'm calling them icicles. 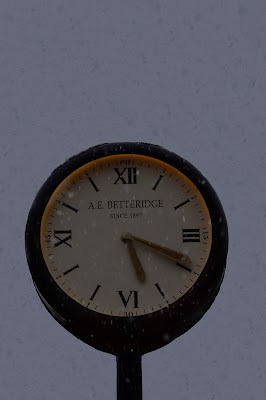 Last year I took a picture of the same clocktower with snow falling around it. Between last year and this year, I managed to delete those pictures. This year I was able to make up the picture, but as with any picture you take twice, the first picture is always the best. I had to change something to at least make this picture interesting. So I created this image. 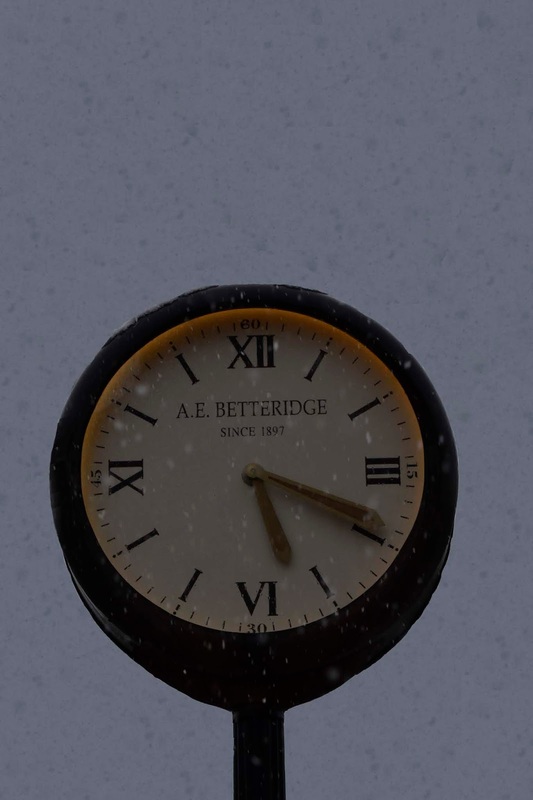 I took a picture of the clocktower with snow falling. I didn't like it as much so I photoshopped a picture of mine with heavy snow falling in the background. I like it, but once again the first picture is always better than the second. This picture is very similar to the last one, but I think it is also very different. It is similar in the way that I took the picture of an object with snow falling around it. But it is different because of the snow. I like this picture because almost all of the snow is out of focus. The snow only appears are grey spots on the picture. 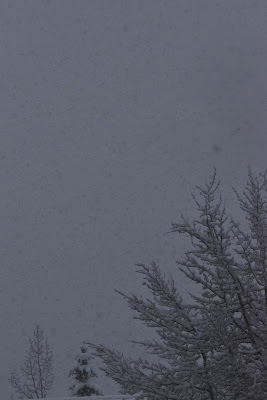 As the day came to an end, the snow started to fall even more. I went to the base of the mountain where I pointed my camera up and started taking pictures of the objects with snow falling all around them. One of them was this branch. I took the picture with my macro lens which meant that whatever is in focus would have great detail but anything out of focus would be very blurred. I like that because it makes the snowflakes look very interesting and you are able to see the differences between snowflakes. 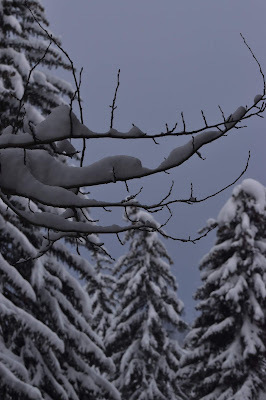 I took this picture as I was going down a ski run in the trees. It was snowing very heavily as you can see the snowflakes falling on the trunk of the tree. I like how the viewer can see the marks on the snow. It gives the viewer something more to look at. Also, I like how similar to the last picture, the trees just appear to stop. This is caused by the low clouds which made for some really interesting pictures. As the snow fell, it covered everything. 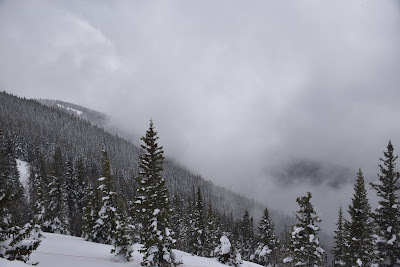 The snow also caused some clouds to be extremely low to the ground. I like the clouds because they help the picture 'end.' The clouds provide a clean background that doesn't distract the viewer from the foreground snow either on the ground or trees. Similar to last year and some of the years before, I was able to capture some pictures of the snow from on the mountain. Sometimes I brought my camera up the mountain but other times I didn't want to waste the moment so I just took the picture on a phone. I took this picture because I found the 'snow fog' interesting. I like how it allows the viewer to see the foreground trees but the trees in the background sort of fade away.